With the Back-End SQL server in place, I could look at deploying System Center. I deployed a new VM from template, this time keeping the default settings. 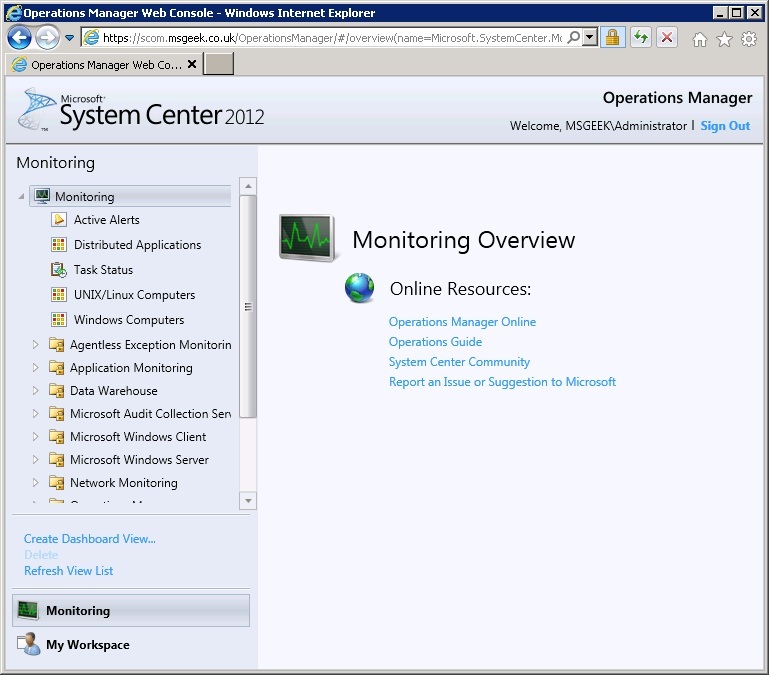 As a side note, the virtual infrastructure is certainly growing. 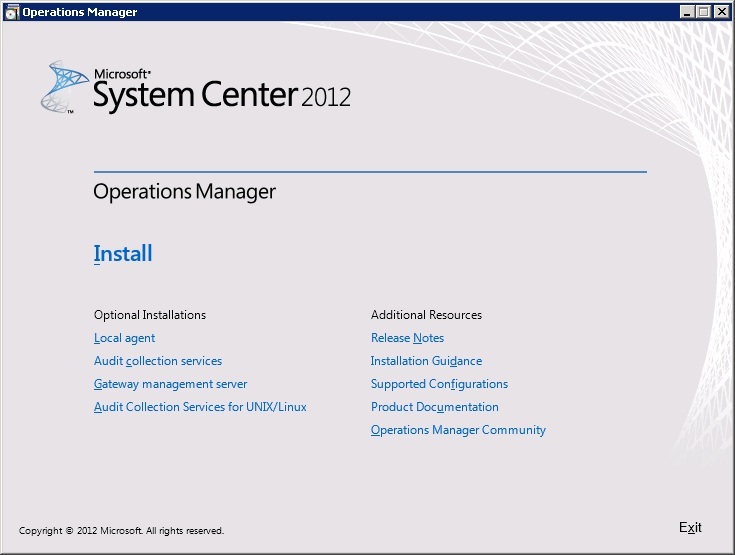 Once the VM had been provisioned and I had installed outstanding updates I downloaded and ran the System Center Operations Manager installer. 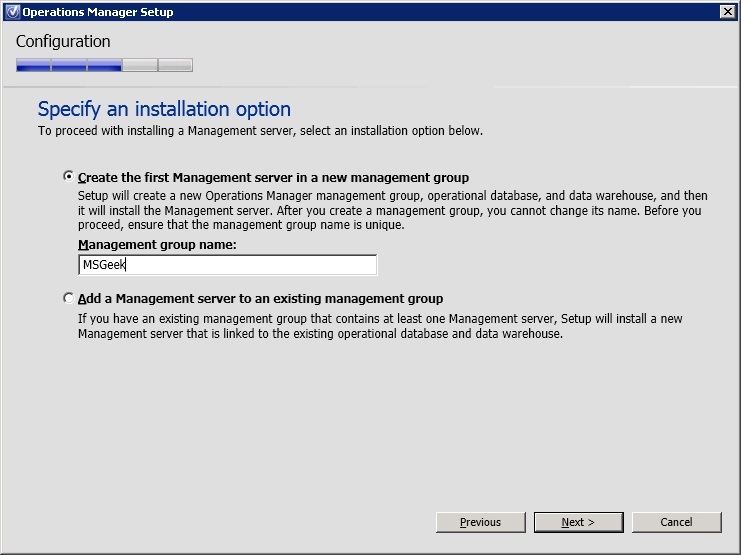 From there I selected install, and checked to install the Management server, Operations console and Web console. 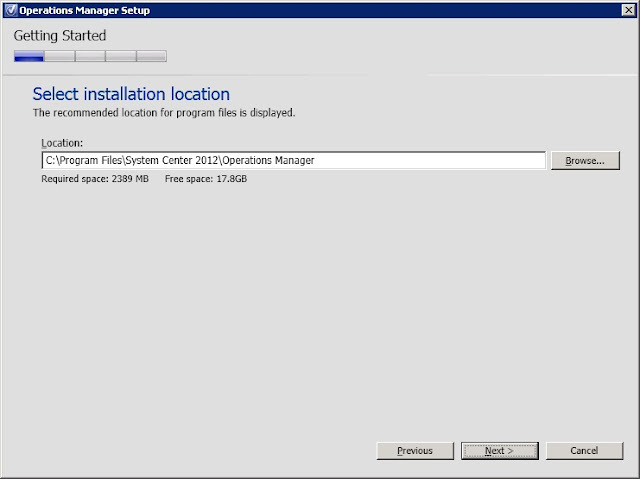 I kept the install location as the default on the C:\ drive. 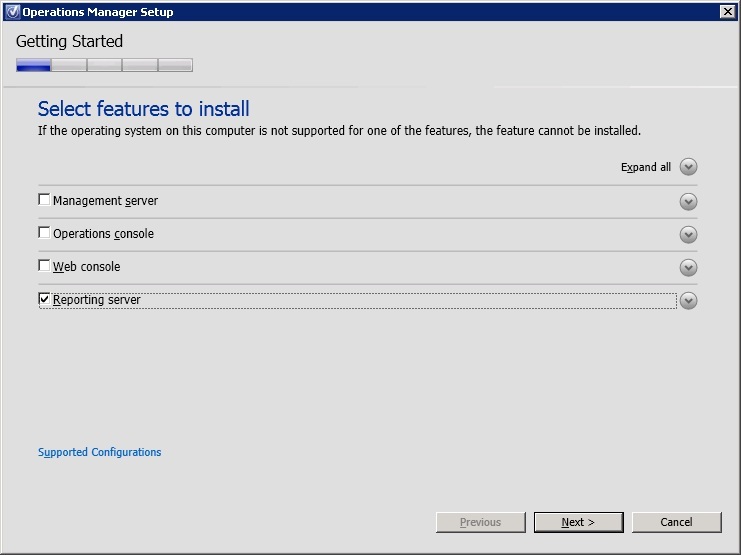 Because I haven't installed any of the pre-reqs so far, the installer comes back with a list of what components are missing, specific to the features I've opted to install, which gives a nice, exact list to work through. 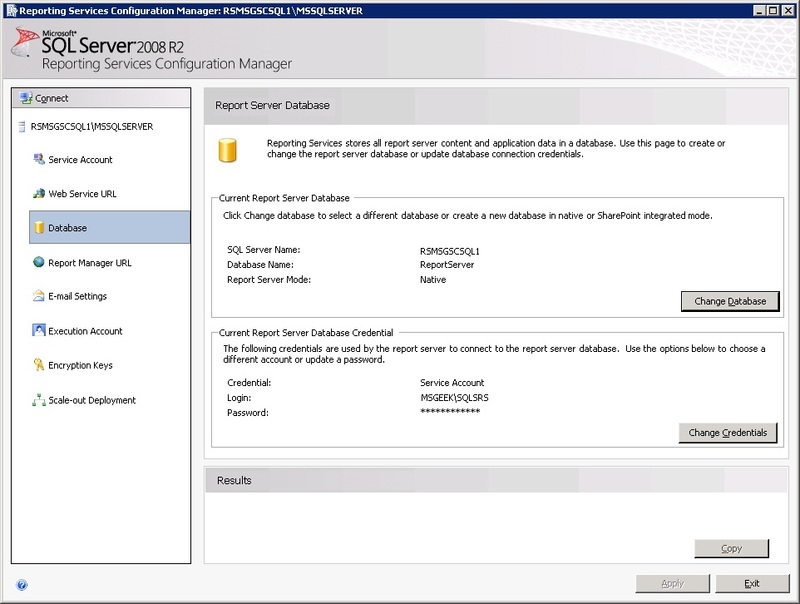 First I downloaded and installed the Report Viewer 2010 redistributable available here. 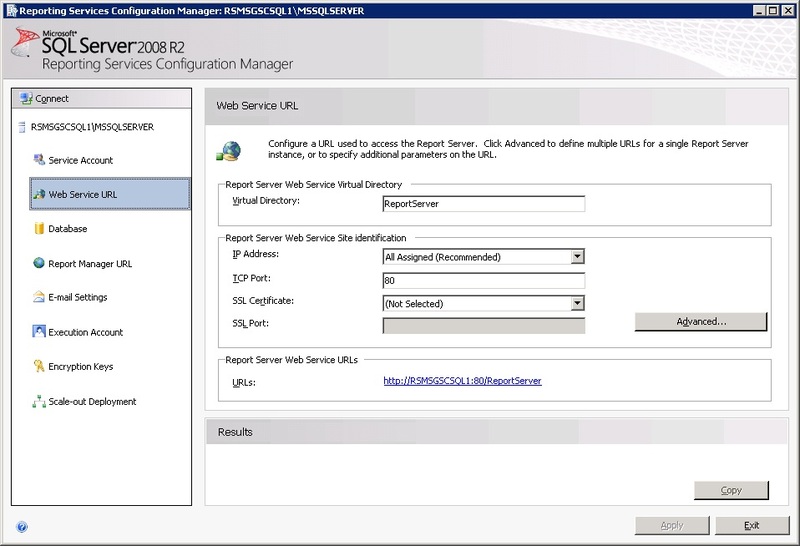 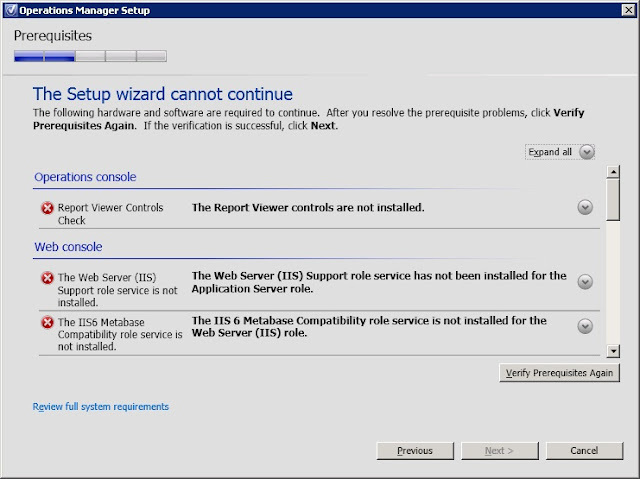 Next I loaded the roles wizard from Server Manager and opted to install IIS. 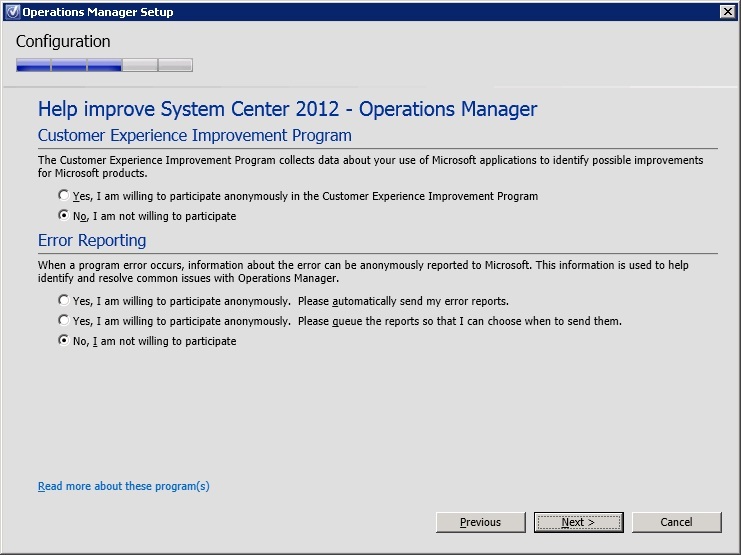 With the necessary components installed, a re-verification of the pre-requisites dropped the error count down to two. The ASP.NET handler can be registered in IIS running "%WINDIR%\Microsoft.NET\Framework64\v4.0.30319\aspnet_regiis.exe -r" from a command prompt window. 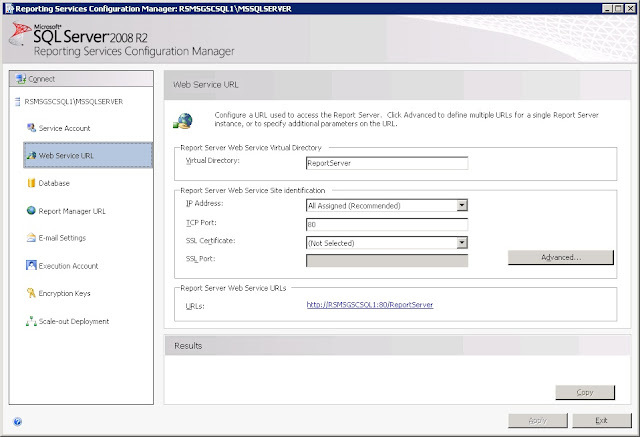 Once that was done, I opened up IIS Manager and went into ISAPI and CGI Extensions. 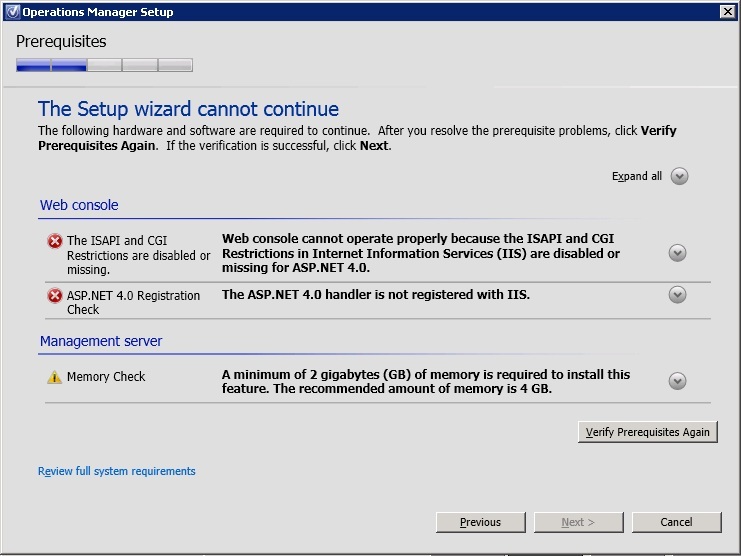 Here, I set both versions of .NET framework v4 to allowed. 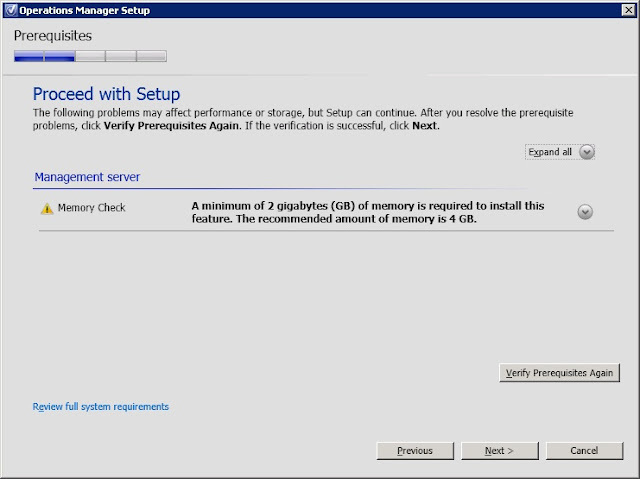 Now, at this stage, re-running a verify pre-requisites should have cleared these last two errors. 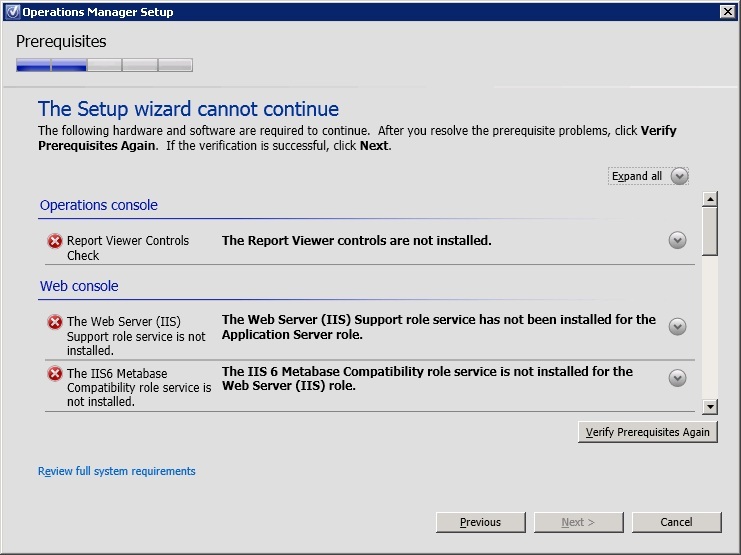 However they persisted, so I first ran an IISRESET, which had no effect on the two remaining pre-req checks, so then just performed a reboot. 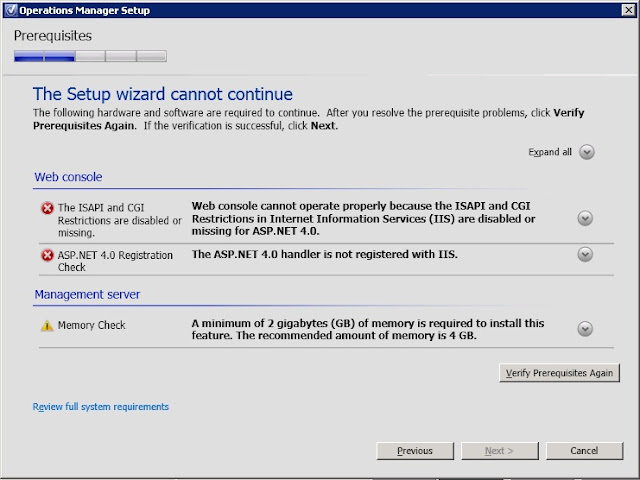 After the reboot, and re-running the installer, the last two errors had cleared and I was left with a single warning about memory. I'm not too worried about the memory only just hitting the minimum specs, the environment is relatively small, and if it ever becomes a bottleneck I can just increase it, so I proceeded on with the installation. 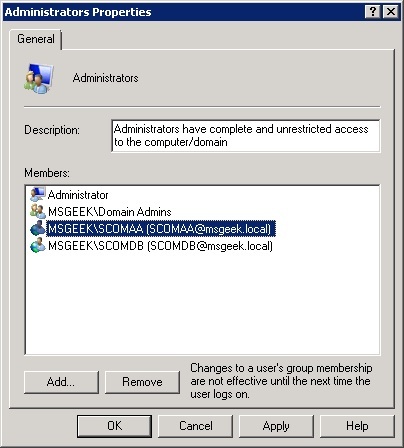 I opted just to go with MSGeek as the Management group name. 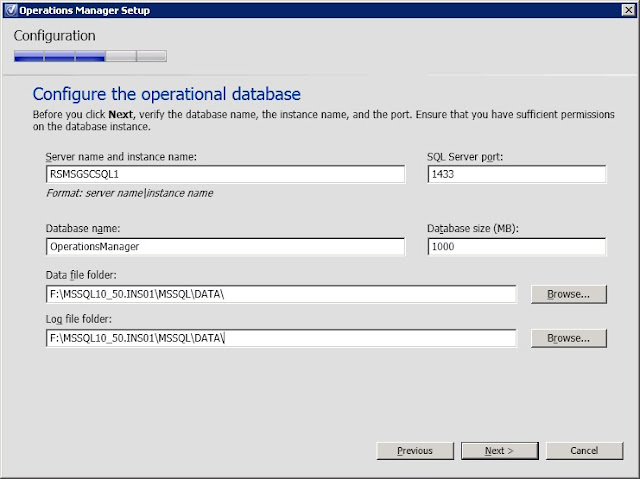 After accepting the licence agreement, you are presented with the option to configure the SQL Server. 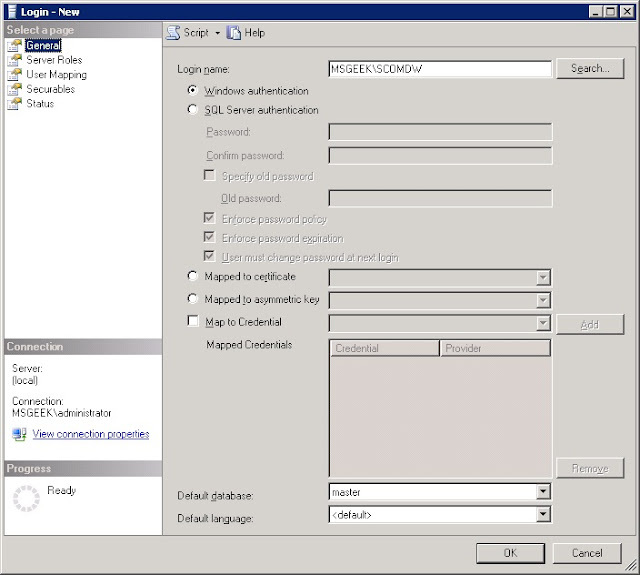 I first logged onto the SQL Server and added a rule to windows firewall to allow inbound TCP connections from machines on 10.0.0.0/24 network on port 1433 to sqlservr.exe. 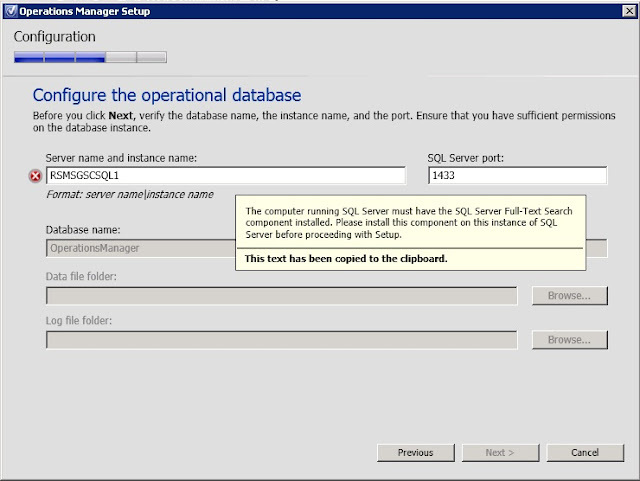 After entering the SQL server details in the SCOM installer, validation failed, reporting that full text search is a pre-req on the SQL Server. 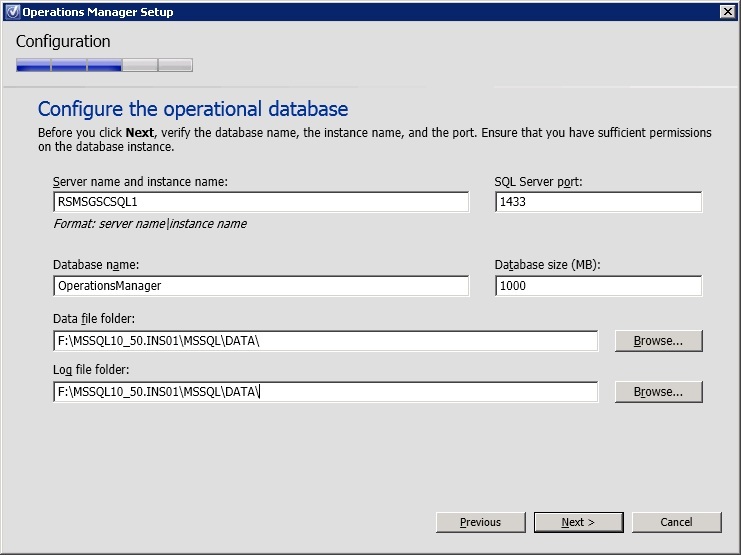 So, back on the SQL Server, I re-ran setup and added the full text search component. 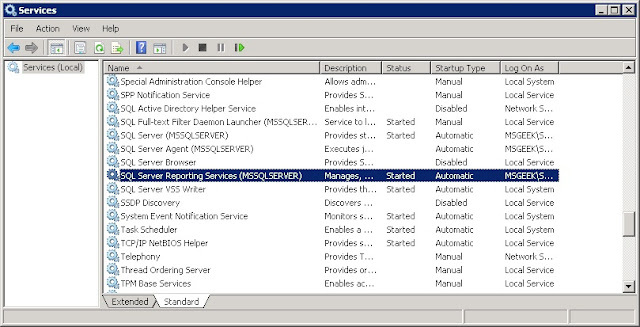 Whilst in setup, I took the opportunity to install Reporting Services too. With full text search installed, validation succeeded. 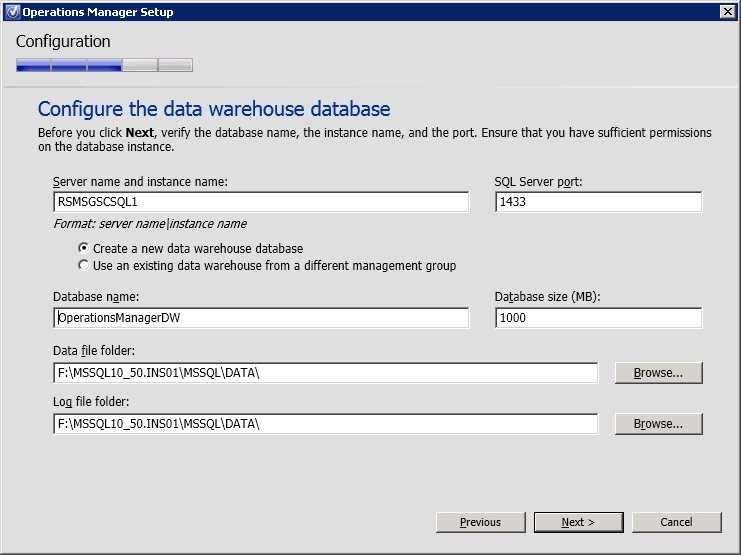 I left the Database locations and size at their defaults. 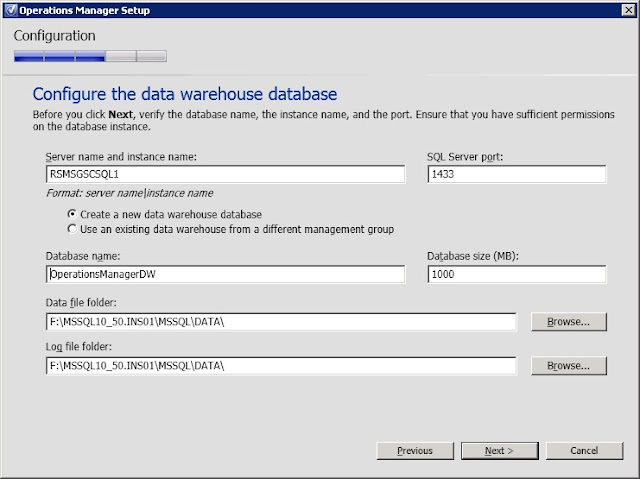 After that, you configure the SCOM Data Warehouse DB, which for now I'll be pointing to the same location. I set the Web console to use the Default Web Site, and ticked the box to enable SSL. 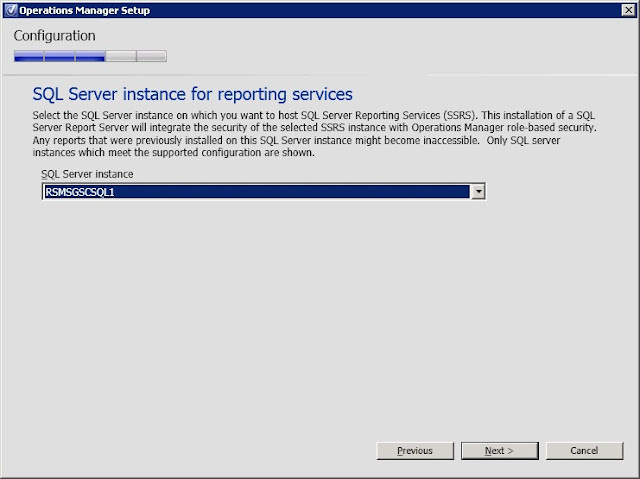 The warning about reporting services can be ignored, I'll install it later directly on the SQL server. 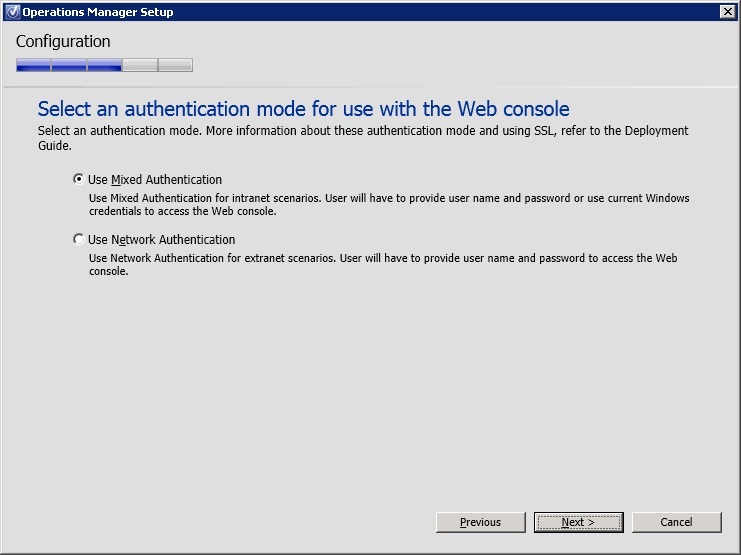 The installer doesn't actually configure SSL for you, I had to open IIS, do the certificate request as outlined in my post covering enabling SSL on the Exchange 2003 Front-End, then edit the bindings in IIS to add the HTTPS binding. 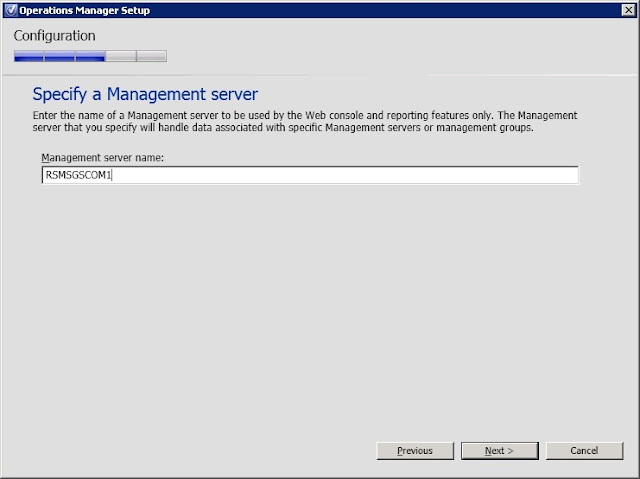 I also went into SSL settings and ticked Require SSL. 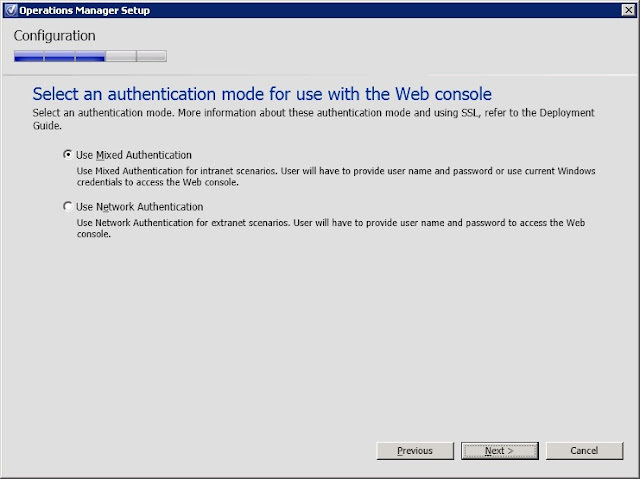 Back in the SCOM installer, I set the web console to use Mixed Mode authentication (scom.msgeek.co.uk won't be going in public DNS). 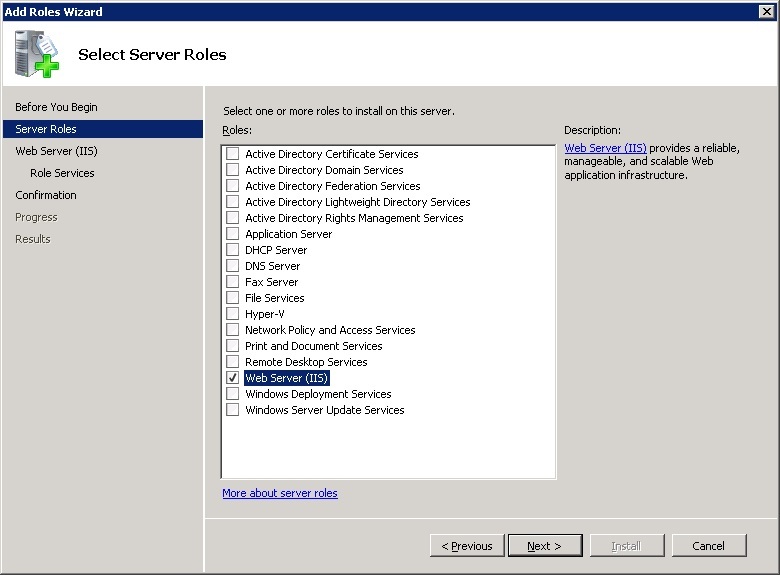 Next, I logged onto a DC and opened up dsa.msc. Here I created a Management Server Action Account. 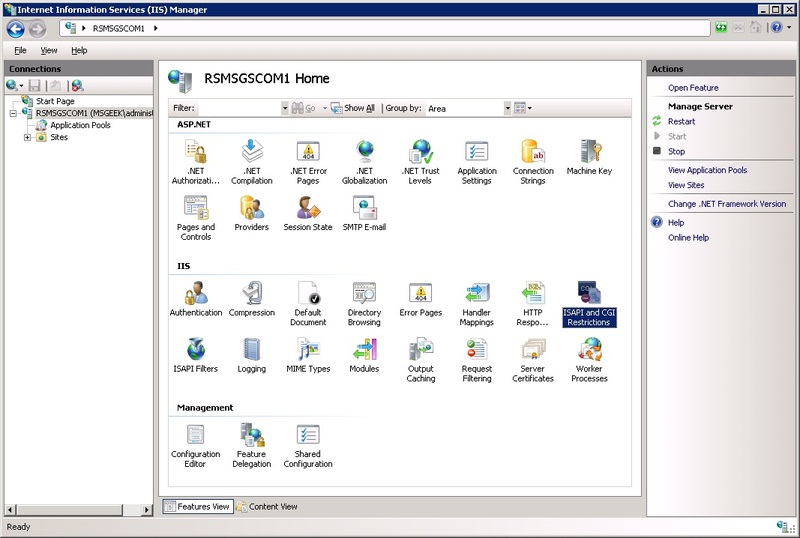 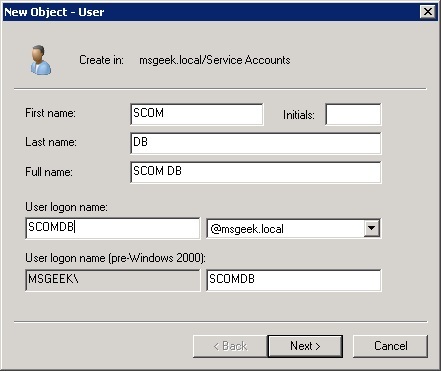 A SCOM Database account. 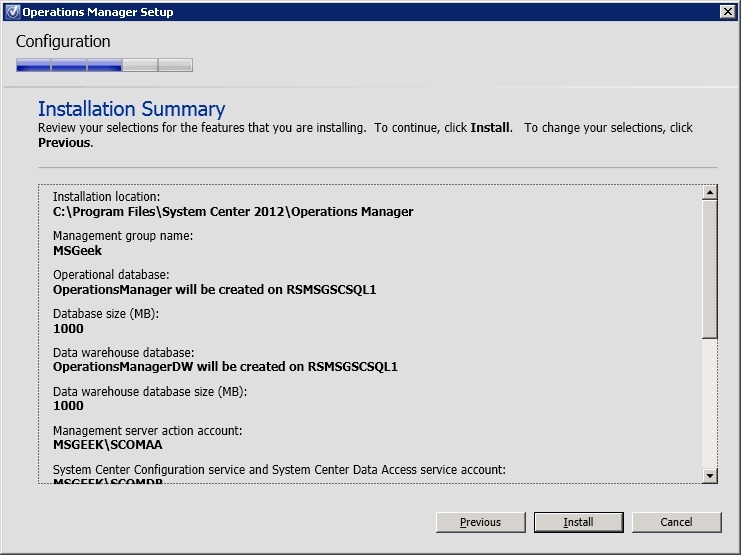 (The Microsoft terminology for this account is actually "System Center Configuration service and System Center Data Access service account", however reviewing the documentation on what the account is actually used for I decided "SCOM DB" was close enough). And a SCOM data reader account. 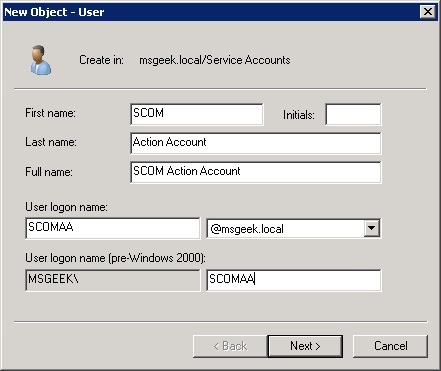 I then manually added the SCOMAA and SCOMDB accounts to the local admins group on the SCOM server. 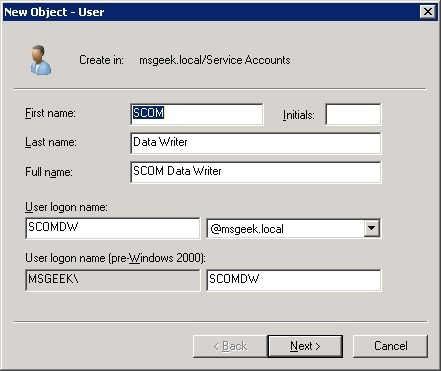 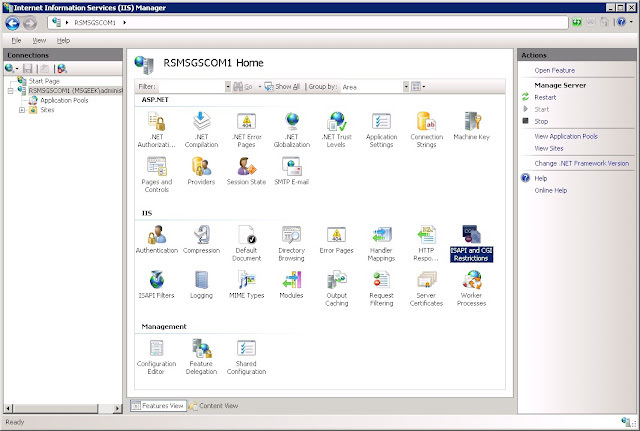 I then went onto the SQL server and granted the SCOMDW and SCOMDR accounts SQL login rights. 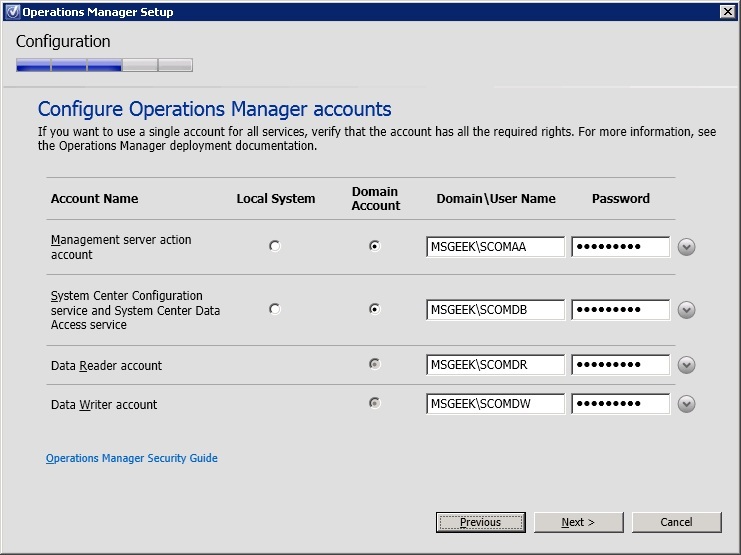 Back in the SCOM installer, I entered the credentials for the accounts I had created. I opted not to participate in the Customer Experience Improvement Program and not to automatically submit error reports to Microsoft. 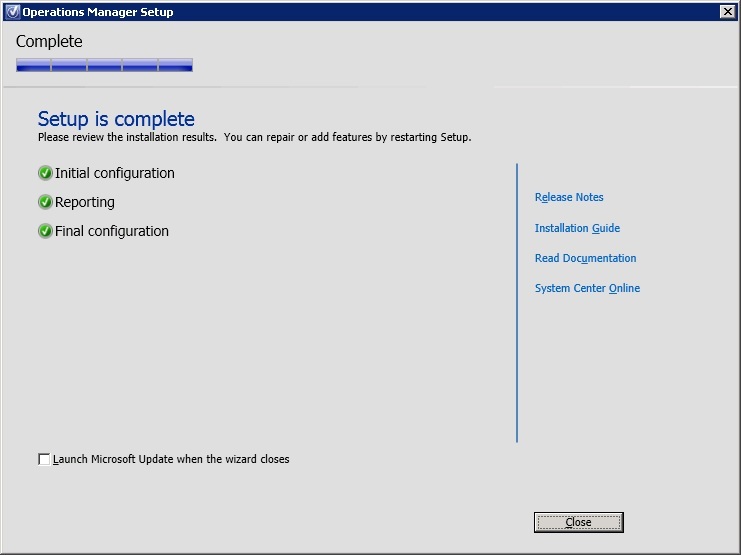 The next screen asks whether to use Microsoft Update to check for Updates. As I'll be using the internal WSUS server I declined. After that you are presented with a summary of the options selected. After clicking install, the installer runs, it took about 10 minutes to get through all the steps, but completed successfully. 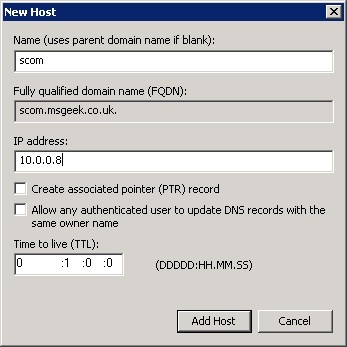 I ran a check for updates which didn't come back with anything, then logged onto one of the DC's and added scom.msgeek.co.uk to internal DNS. 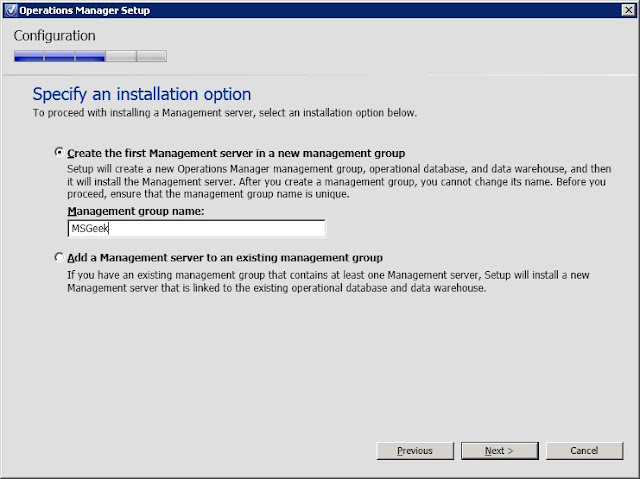 I then logged back onto the SQL server and copied the SCOM install files over. 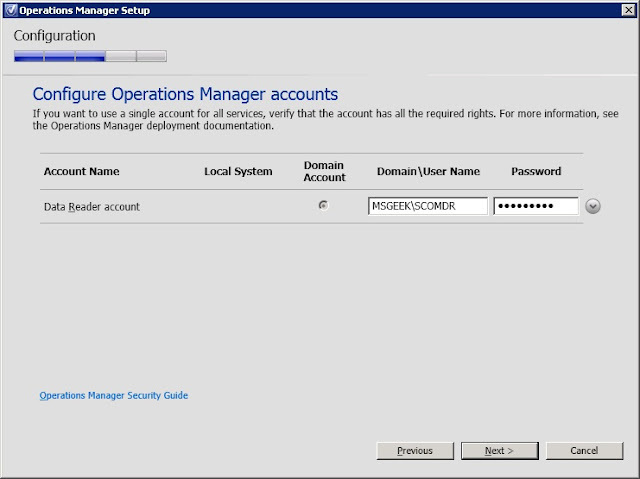 I then opened up reporting services configuration manager, navigated to the web service URL node and clicked apply to assign the default values. 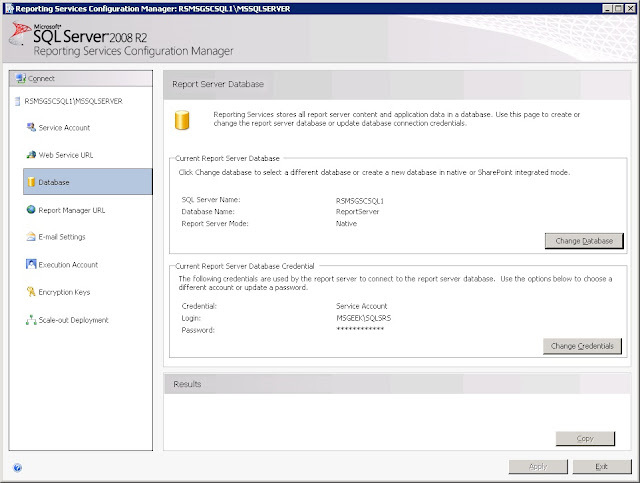 Then repeated the process of clicking apply on the Report Manager URL node too. I then went onto the Database tab, clicked change database and went through the wizard with the default options to create a new database. 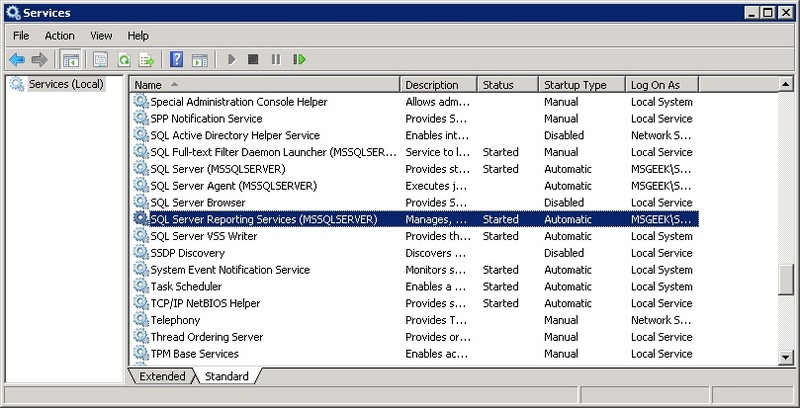 Next, I opened Services and set SQL Reporting Services to automatic startup, and started the service. 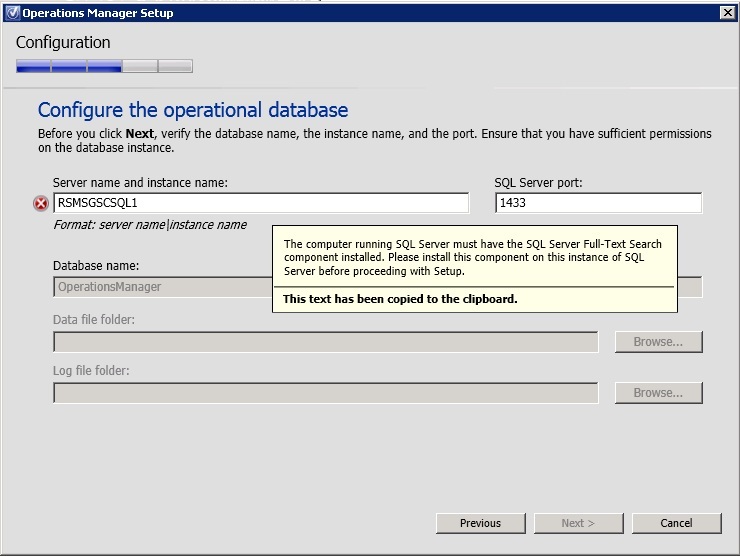 I then ran the SQL installer, this time just opting to install the reporting feature. 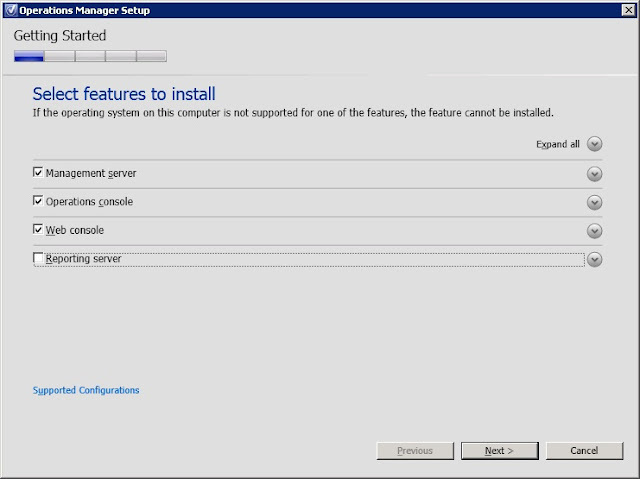 The installer prompts for the Management Server name. 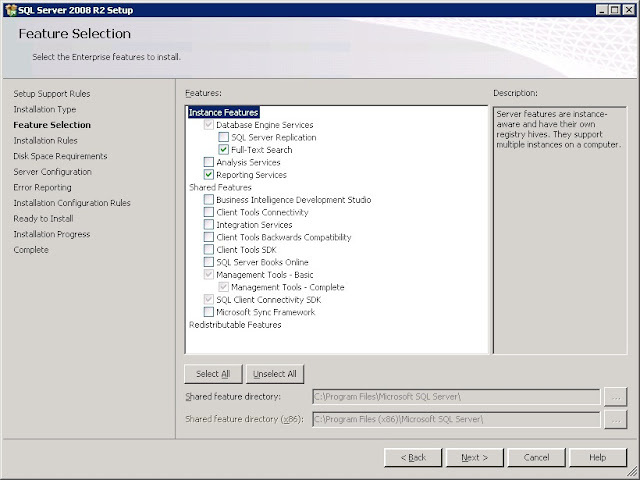 I've only got a single SQL instance installed, so that shows up automatically on the select instance screen. 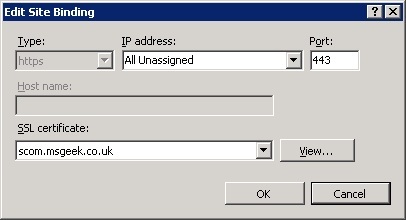 It then just prompts for the Data Reader account credentials. 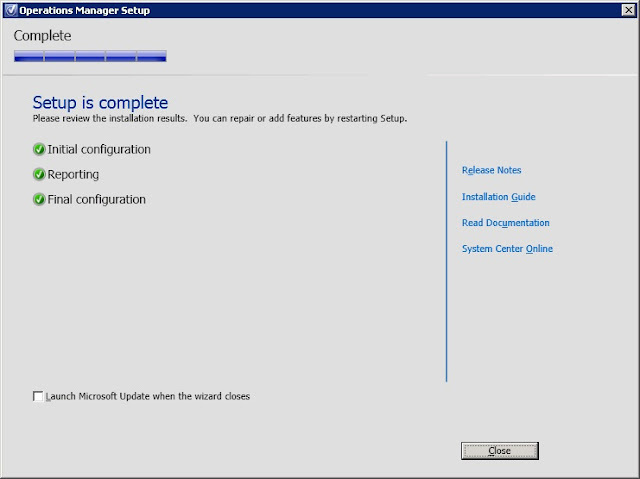 After displaying a summary the install kicks off. 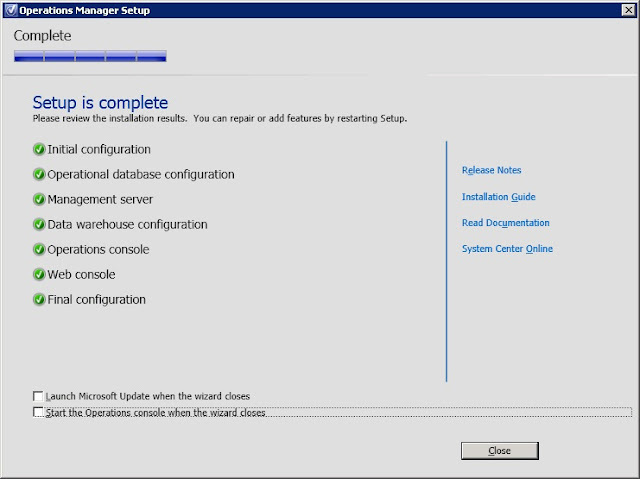 It completed successfully. 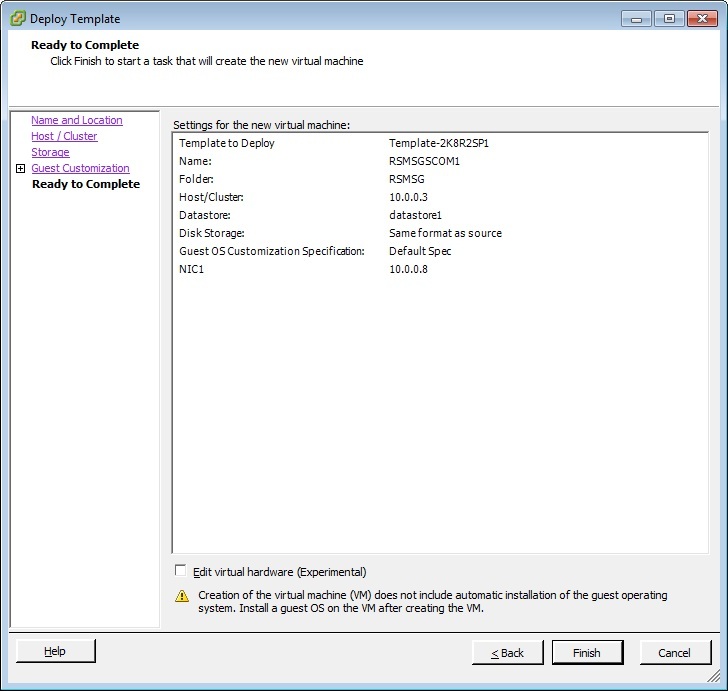 Finally, I wanted to do a couple of sanity checks to ensure the install was working as desired. 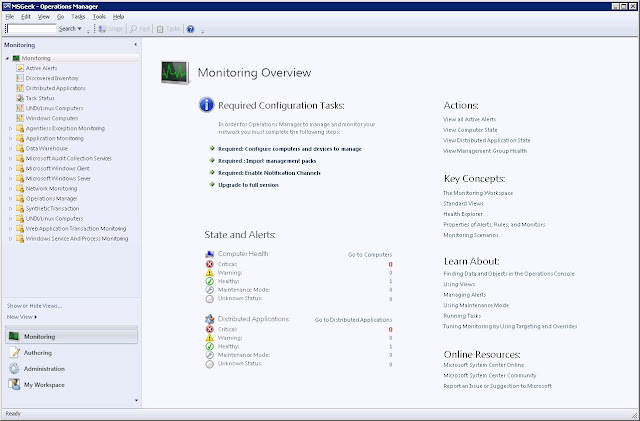 First I launched the SCOM operations console. 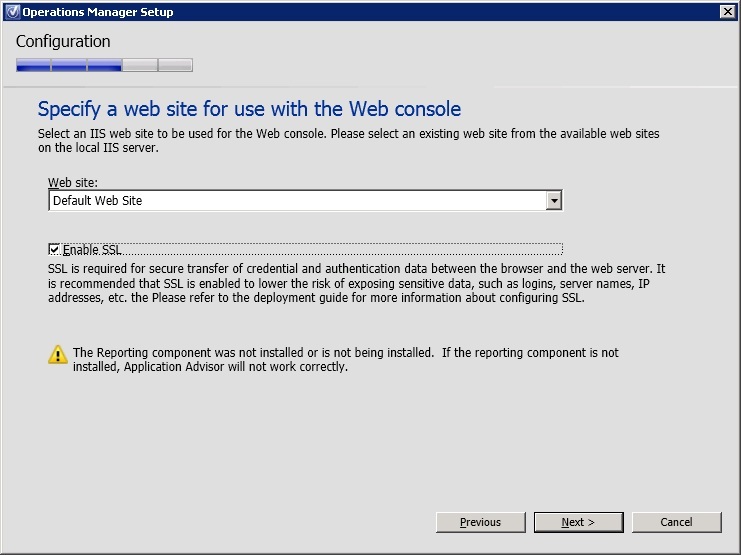 Secondly, I wanted to check out the web console. It needed a silverlight install but once that was done it all looked good.